Iodine deficiency is thought to be the most common cause of hypothyroidism and the one true cause of goiters. Once researchers realized this many decades ago, health authorities around the world began adding iodine to table salt. But interestingly allopathic medical science is now saying that in countries where iodine has been added to highly processed table salt, the rates of autoimmune thyroid disease have risen. 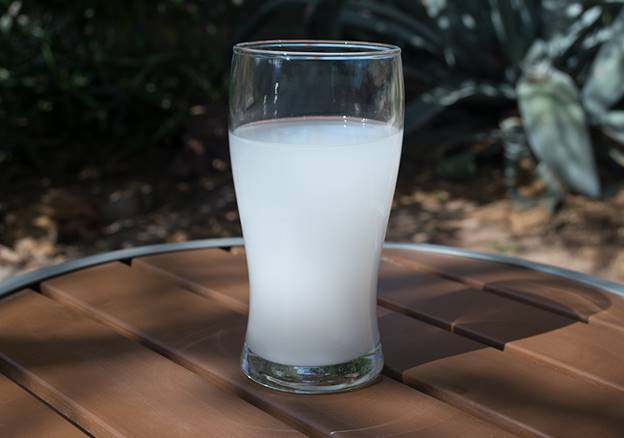 Though there are several studies  from around the world that support this conclusion, one of the principle studies was published in the European Journal of Endocrinology asserting this without any attention to or control of the toxicity of the salt itself, selenium status of the studies’ participants, or the danger that water fluoridation potentiates for the thyroid. These factors and others are involved in thyroid and autoimmune diseases; mercury is an especially dangerous thyroid poison in this regard. So is bromide and they are putting more than ever in bread. Contamination from chemicals and heavy metals has cumulative effects such as weakening the immune system. When heavy metals are found on the receptor sites of the thyroid they literally invite the immune system to strike out against thyroid cells. The immune system produces thyroid antibodies in seek-out-and-destroy missions against these foreign substances. Depending on the specific subtype, thyroid antibodies can destroy thyroid cells, cause thyroid inflammation, or cause thyroid cells to produce excess thyroid hormone. 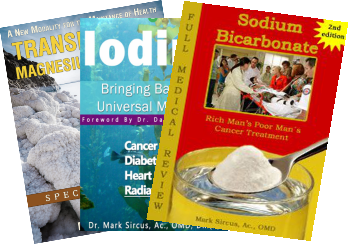 When we add the total ignoring of magnesium deficiency as yet another uncontrolled factor we quickly realize how careful we need to be about interpreting scientific medical conclusions. Add the fact that the thyroid is affected by widespread mercury contamination and we can see how distorted medical studies can become in their lust to study one factor at a time while remaining blind to other crucial issues. Studies have documented that mercury causes hypothyroidism, damage of thyroid RNA, autoimmune thyroiditis,,, and impairment of conversion of thyroid T4 hormone to the active T3 form. These studies along with clinical experience indicate that exposure to mercury and/or toxic metals appears to be the most common cause of hypothyroidism and the majority of patients treated with metal detoxification recover or significantly improve. Manmade sources of mercury: dental amalgams, thimerosal in vaccines, mining of silver, coal-fired electrical plants, municipal incinerators, crematoriums, curing of plastics, fireworks (pharoah’s serpents and bengal green lights), anatomical specimen preservatives, fungicides and pesticides (golf courses), laboratory tests in slide preparations and reagents, certain drugs, thermometers, fluorescent lights, certain button-sized batteries. As far back as the early 1920s, Goldemberg showed that fluoride was displacing iodine, rendering the community hypothyroid from iodine deficiency. The thyroid-stimulating hormone output from the pituitary gland is inhibited by fluoride, thus reducing output of thyroid hormones. Fluoride competes for the receptor sites on the thyroid gland and so do mercury and bromide. This contamination might also invite an autoimmune response. Below we will examine a Brazilian scientific study that is already being used by doctors as a reason to fly as far away from iodine supplementation as possible. If certain people had their way they would now take all iodine out of salt, which is the only way the masses of humanity have access to supplemental iodine even if the dosages provided are far too low to protect the thyroid from the onslaught of chemical and heavy metal contamination. This of course would be very dangerous to future generations of children whose parents and environment are already extremely iodine deficient (except along coastal areas). It is just because of the vast contamination affecting everyone that the thyroid needs to be protected with increased levels of iodine. During this past decade iodine concentrations in table salt have been slightly modified to be within the new official limits: 20-60 mg/kg salt. Previously these concentrations were in the 40-100 mg/kg range though there have been reports that salt advertised as containing iodine actually had none. In the study, in 45.6% of the 1085 randomly selected participants receiving iodine in their salt, iodine excretion was excessive (above 300 µg/l), and in 14.1%, it was higher than 400 µg/l. The prevalence of chronic autoimmune thyroiditis (CAT) (including atrophic thyroiditis) was 16.9% (183/1085); women were more affected than men (21.5% vs 9.1% respectively, P=0.02). Hypothyroidism was detected in 8.0% (87/1085) of the population with CAT. Hyperthyroidism was diagnosed in 3.3% of the individuals (36/1085), and goiter was identified in 3.1% (34/1085). People thought to have certain immune system genes are seen to be more susceptible to developing thyroid disorders when they’re exposed to certain environmental triggers. Up to 20 percent of the population has these genes although only about four percent of the population develops autoimmune thyroid disease (AITD). Researchers concluded thatfive years of excessive iodine intake by the Brazilian population may have increased the prevalence of CAT and hypothyroidism in subjects genetically predisposed to thyroid autoimmune diseases. With this conclusion, easily-duped doctors have come out against iodine supplementation in any manner, shape, or form for men, women, and children of all dispositions. Please pay careful attention anytime the medical community throws out these key words genetically predisposed because it often demonstrates an area of medicine they know very little about. Usually when doctors and medical scientists throw up genetic considerations, which they do all the time about autism, it’s a red flag telling us they either don’t know what they are talking about or they don’t want to admit the real causes of a disease. Iodine is a natural chelator of mercury, but most people consume nowhere near the amount needed for proper thyroid function and protection from mercury, fluoride, and other dangerous halogens. Let’s examine the amount of iodine they are calling excessive. At 60 mg per kilogram we would have to calculate that easily about half of that would be lost to evaporation because table salt sitting out on the table, with iodine in it, would leach that iodine into the air, leaving, at best, 30 mg in a kilo. How long does it take for an average person to go through a kilo of salt? One could probably calculate approximately 180 days but let’s cut that down to 90 days. At that rate we are talking about daily dosages below 1 mg per day of iodine supplementation, and perhaps as low as 500 micrograms (0.5 mg) or even much less. This compares with the average dietary intake by the Japanese population of 12.5 mg a day or the amount recommended by the “iodine doctors” of as much as 50 to 100 mg a day when they use it to treat cancer. I have Hashimoto’s (10 yrs). Started taking Nascent Iodine about 6 weeks ago. I also have started using Transdermal Magnesium. For some time now I have been using barley greens, and vitamins B, D, C and omegas. Since taking the Nascent Iodine and Magnesium I have improved. My muscle aches and pains and anxiety etc are so much better. There are now doctors who feel that patients with autoimmune thyroid disease (Hashimoto’s and Graves’) should not be taking iodine supplements. The real truth though is that this population should not be taking just any iodine supplement and they should never be taking iodine without appropriate selenium and magnesium supplementation as well. As is usual with most minerals, organic (safe) iodine is found in much higher amounts in organic foods. The form in which we take minerals is mission critical. Most tinctures of iodine are toxic and not appropriate for oral consumption. 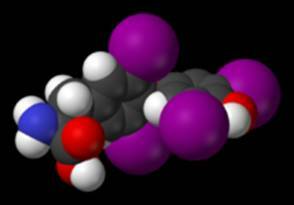 Thyroid hormone is composed of three or four atoms of iodine and one molecule of the amino acid tyrosine. There are three forms or chemical structures of iodine. There is iodine in its atomic I¹ form and then molecular I² and I³ forms. One of the principle reasons why I recommend Nascent Iodine for oral consumption and the use of Lugol’s only for transdermal use is that the Nascent Iodine is in the I¹ form plus it is much gentler to the taste buds and the stomach than the Lugol’s when used orally. The I¹ form is the form the body transforms most easily into thyroid hormone. There is a lot of conflicting information on the internet regarding the application of iodine in those with Hashimoto’s. Dosage and form of iodine and a full supporting protocol as well as close medical supervision are especially important in these cases. LL Magnetic Clay, which has been kind enough to supply me with many 4 ounce bottles of iodine, so I can distribute iodine freely when I go to the interior at my Sanctuary project, is also being kind enough to offer my readers for one week only at 25 percent off of their Nascent Iodine in both their 1 ounce and 4 ounce sizes. The discount code when you go to their site is “imvaiodine”. 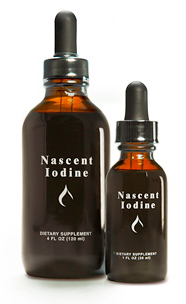 Please note that this is a two percent Nascent Iodine not one percent that was in the original formula so you are now getting twice as much iodine in each bottle. Most individuals with amalgam fillings or other exposures to mercury toxicity are not consuming natural chelators such as zinc, selenium, iodine, sulfur, and silica that would bind to the free mercury to help excrete it. Mercury (usually with a +2 charge) can grab the biological spaces that should be filled by another essential mineral. As a result, there may be plenty of the mineral found in the blood, urine, hair, etc., but due to the displacement at the active sites, mercury interferes with the activity of and depletes these essential minerals. Doctors who are recoiling against decades of iodine supplementation and would rather leave the population exposed to worsening iodine deficiencies are playing a cruel game. Iodine is a mineral found in trace amounts throughout the body. 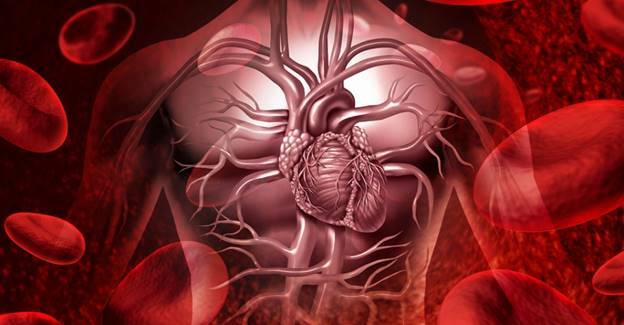 Iodine is extremely important since the cells need it to regulate their metabolism. Without it, people are known to suffer from swollen glands in the throat, thyroid diseases, increased fluoride toxicity, decreased fertility rates, increased infant mortality rates, and (with severe deficiency) mental retardation. It has been theorized that iodine deficiency is a causal factor of ADHD in babies of iodine-deficient mothers. A typical reading from an encyclopedia suggests that iodine deficiency slows all the systems of the body: The digestive system becomes sluggish, nails grow more slowly, skin and hair become dry and dull, tendon reflexes stiffen, sensitivity to cold increases, and the pulse slows. 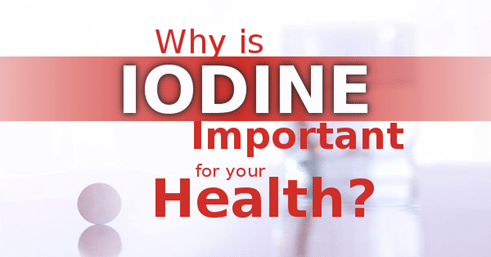 Iodine helps form who we are to such an extent that a deficiency can lead to a dulling of the personality, deterioration of attention and memory, and an increase in irritability due to fatigue and extreme apathy. “The group we are most concerned about is pregnant women, who need more iodine anyway,” says Dr. Robert Utiger, professor of medicine at Harvard Medical School. “There is the possibility of irreversible damage to the fetus if the mother is deficient.” Utiger adds. Yet many are still confused as to whether they should supplement if they have a low or underactive thyroid, or some type of thyroid condition such as hypothyroid, hyperthyroid, elevated thyroid autoantibodies, or Hashimoto’s thyroiditis. No matter what the condition, a healthy thyroid system is crucial. A lack of iodine for the thyroid is a huge metabolic problem. How can anyone’s body make energy if it is lacking the iodine to make thyroid hormone? Dr David Brownstein, Dr Jorge Flechas, Dr. Guy Abraham, Dr. Mark Starr, Dr. Garry Gordon and Dr Michael Schachter are among the doctors who all recommend substantially higher amounts of iodine than the RDA. Let’s consider the qualities of commercially available table salt. It is obvious in the above Brazilian study that no attention was paid to the dangerous and damaging effects that the salt itself might be having on the population. It is possible that the salt, not the iodine, led to increases in the prevalence of CAT and hypothyroidism in subjects genetically predisposed to thyroid autoimmune diseases. After all, refined salt is highly-processed—bleached, filtered, and stripped of other naturally occurring trace minerals. After this processing, chemicals are added to keep the salt from absorbing water and clumping up, and it is often iodized. All salt came from the ocean at one time, and like other elements from the sea such as magnesium chloride, there are varying degrees of purity as well as concentration. Just because a salt is labeled as sea salt does not mean that it is unrefined or that it is in any way better than “regular” table salt. Both sea salt (found in the grocery store) and table salt are practically 99.9 percent sodium chloride with virtually all the sea minerals processed out. 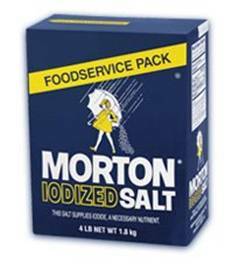 Most salts labeled “sea salt” are refined salts. How do you tell? You have to look at the color of the salt. If it has some color to it (other than white), it is probably unrefined. White salt is actually a slow-acting poison for it is not complete; it is not as nature intended so it will cause problems and wreak havoc in one’s health. Our bodies need only 250 mg of sodium each day in order to flush our cells, maintain a balance of fluid, regulate the circulatory system, and maintain normal nerve impulses. Sodium and chloride are essential to the body. Instead of getting only 250 mg per day, most people are consuming 4,000-10,000 mg per day in diet sodas, hamburgers, eggs, frozen dinners, bottled veggie juices (V8), and chips just to name a few. As well as being addictive and a cause of high blood pressure, table salt promotes diseases such obesity, hypertension, coronary heart disease, myocardial infarction, angina pectoris, stroke, congestive heart failure, kidney failure, PMS, and manic-depression. Processed foods have very high levels of salt, and a diet high in salt actually leads to salt dependence by your body. This is why you crave salty foods—just like a smoker craves the nicotine in a cigarette. 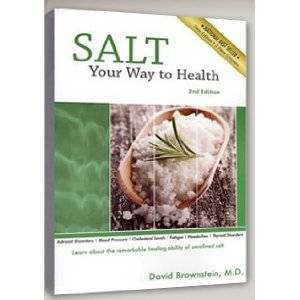 Dr. Brownstein says, “Years ago salt manufacturers decided that pure white salt is prettier than off-white salt and that consumers prefer pretty white salt. So they started bleaching it. They also added anti-clumping agents to increase its shelf life. The problem is that the chemicals added to keep salt from absorbing moisture on the shelf interfere with one of salt’s main functions: to regulate hydration in your body. The sodium chloride in table salt is highly concentrated, denatured, and toxic to your body. Ever put salt on an open cut? It burns!!! Refined salt has the same effect on internal tissues and causes a negative reaction: your body retains water to protect itself, and your cells release water to help dilute, neutralize, and break down the salt. 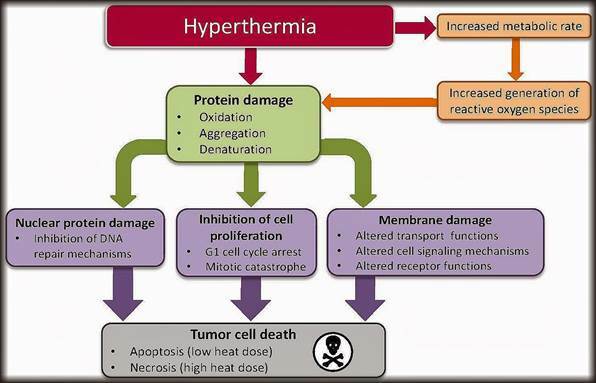 This loss of water dehydrates and weakens your cells and can even cause them to die prematurely. Natural sea salt is far superior to chemically-treated iodized table salts as it contains all 92 trace minerals, and it’s only 84% sodium chloride while table salt is almost 98%. Mazokopakis EE, et al. Effects of 12 Months Treatment with l-Selenomethionine on Serum Anti-TPO Levels in Patients with Hashimoto’s Thyroiditis. Thyroid. 2007 Aug;17(7):609-12. Sin YM, Teh WF, Wong MK, Reddy PK – "Effect of Mercury on Glutathione and Thyroid Hormones" Bulletin of Environmental Contamination and Toxicology 44(4):616-622 (1990); & (b) J.Kawada et al, “Effects of inorganic and methyl mercury on thyroidal function,” J Pharmacobiodyn, 1980, 3(3):149-59; &(c) Ghosh N. Thyrotoxicity of cadmium and mercury. Biomed Environ Sci 1992, 5(3): 236-40; & (d) Kabuto M – "Chronic effects of methylmercury on the urinary excretion of catecholamines and their responses to hypoglycemic stress" Arch Toxicol 65(2):164-7 (1991). Sterzl I, Fucikova T, Zamrazil V. The fatigue syndrome in autoimmune thyroiditis with polyglandular activation of autoimmunity. Vnitrni Lekarstvi 1998; 44: 456-60. Sterzl I, Hrda P, Prochazkova J, Bartova J, Reactions to metals in patients with chronic fatigue and autoimmune endocrinopathy. Vnitr Lek 1999 Sep; 45(9):527-31; & (c) The beneficial effect of amalgam replacement on health in patients with autoimmunity. Prochazkova J, Sterzl I, Kucerova H, Bartova J, Stejskal VD; Neuro Endocrinol Lett. 2004 Jun; 25(3):211-8. Thyroid and the environment: exposure to excessive nutritional iodine increases the prevalence of thyroid disorders in São Paulo, Brazil DOI: 10.1530/EJE-08-0192 European Journal of Endocrinology, Vol 159, Issue 3, 293-299, Thyroid Unit (LIM-25) Division of Endocrinology, Department of Clinical Medicine, University of São Paulo Medical School.